I think that I mentioned before that I wanted to do both small spaces and a whole room for this challenge. Well, I had two small spaces in mind and today I tackled the first one. I have 4 cupboards in my kitchen that are dedicated to food storage. Sadly, when I moved in, I unpacked the kitchen in a hurry and ever since then, I've had a tough time finding things when I wanted them. Well, no more! Ok, no more for these two cupboards anyway..hehe..
Meet my cupboard before I touched it. Things were just tossed in there anywhere I could get them to fit. Now, I bet you thought I'd totally forgotten to give you a challenge for today. Nope! I remembered..mwahahaha (that's my evil laugh..pretend to be intimidated, ok?). For today, I want you to go open up your kitchen cupboard where you store things like glasses and coffee mugs. Do you have enough that you could invite your entire neighborhood and not run out? Take some time today to slim down the herd and make room for more things that you love! - Honestly, the hardest part was making myself stand on the step stool to pull down what had been shoved onto that top shelf. I have a real fear of heights so getting up there was a challenge. I did it though! - Well, first I got rid of that box of Hamburger Helper that expired 7 years ago. I also got rid of items that we'll never eat or that had been way expired. Eating it is not worth the risk of food poisoning! Then, I put things in groups of like so that I can now reach right in and find it. I can also glance in and see what I need to get at the store. Time saver and money saver all in one cupboard! - I freecycled the food that could be freecycled and tossed out what couldn't. - Hmm...creative storage. Nope, it didn't happen in this space either. 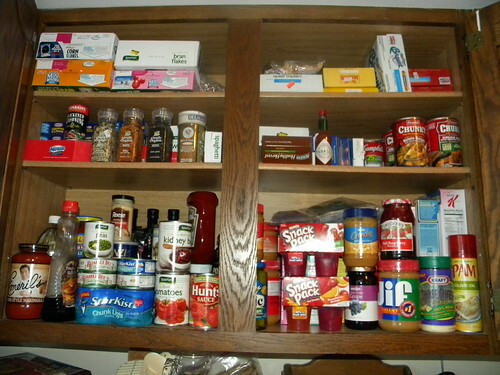 I just used the shelves that were already there and the food that we already had, as well. I did, however, do mental divisions of food types in the cupboards. 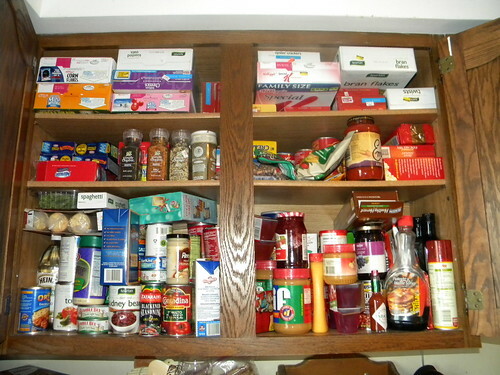 This is my daily food cupboard. I still need to tackle my baking/dessert cupboard. - Well, I don't think I probably should with this space. Looking at the before and after photos, I can't see much of a difference. I know that there is one because I've been cooking out of this cupboard since I did the challenge and it's been a huge difference to be able to just reach in and grab what I need. Organized spaces = Organized Peace of Mind and cleaning/organizing this cabinet has made a huge difference for me. What a prize that is! Good challenge! I did something different though. I cleaned out my refrigerator and freezer in my kitchen. Still need to do the deep freeze but eh, it didn't happen today, but it might happen tomorrow! I threw away four grocery bags of old food and expired things and just yuckiness. We haven't eaten at home much lately, and well...yeah, not a good thing. No! Don't make me clean out a kitchen cabinet where I found baby bottles and my youngest kid is 4. Evil laughter indeed. Really? Afraid of heights?? Well KUDOS to YOU for conquering that fear and getting up there! GOOD JOB, too! Isn't it funny that just facing the labels the same direction makes everything look so much nicer? It looks great and I'm sure it feels great to be able to find everything and know what's in your cupboards.